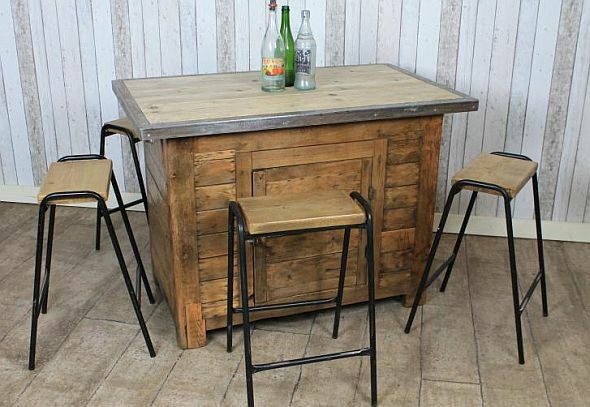 This large and impressive pine vintage kitchen island work station is a wonderful addition to our large selection of original vintage industrial furniture. This vintage kitchen island has been renovated by ourselves to make a fantastically unique kitchen breakfast bar or work station. We have listed a large selection of photographs to show the details, the item has a bleached scrubbed top, which is surrounded by polished steel. This sits upon a large cupboard base with cupboard door and two drawers. This is an extremely useful piece of furniture for any large country kitchen or restaurant. Please note that the other items pictured are not included in this listing, but can be purchased separately. If you would like any further information about this vintage kitchen island do not hesitate to contact us on 01543 375872.